Add all of the cake mix ingredients into a blender and blend until combined. Bake the cake for 25-30 minutes or until the center is completely cooked. Let it cool for another 15 minutes. In a large bowl, crumble the cake mix into very small pieces leaving zero large chunks. Add 3/4 of a can of cream cheese frosting and use a spoon to blend until it’s totally incorporated. You don’t want it to be too gooey, just the right texture to form balls. Roll the dough into 1 inch round balls. Add a strawberry Gusher in the center for an extra special treat. Line the balls on parchment or wax paper and place in the freezer for about 10 minutes. Using a 1 to 2 inch heart-shaped cookie cutter, place it over the cake ball and then press down. With the extra cake from the top use your fingers to mold it into the heart-shaped cookie cutter. Then remove the excess from the sides. You should have a nice heart-shaped cake pop when you remove the cookie cutter. Place the hearts on parchment paper and refrigerate for 1 hour or freeze for 15 minutes so they are firm enough to dip. Melt the candy coating in a heatproof bowl and remove just a few cake pops at a time from the refrigerator. Leave the other ones in there to stay firm. Dip the stick into the melted candy and the push it all the way into the cake pop. Dip the cake pop into the chocolate and use a spoon to coat every side. Gently tap the cake pop against the side of the bowl to remove the excess candy coating. Place the stick in a piece of foam, so that the cake pop can dry standing straight up. It should only take a few minutes to dry. If you’re using metallic spray, you can spray the cake pop while holding it in one hand. Cake pops are the new rage—they’ve made their rounds on blogs and are popping up in Starbucks and on infomercials. Luckily, they’re fun and easy to make! I remember making cake pops about two years ago. When I brought them to parties, people would be amazed to see a piece of cake on a stick! Since they are still fairly new, I'm not surprised that there are still many people who have never heard of, or tasted, a cake pop. 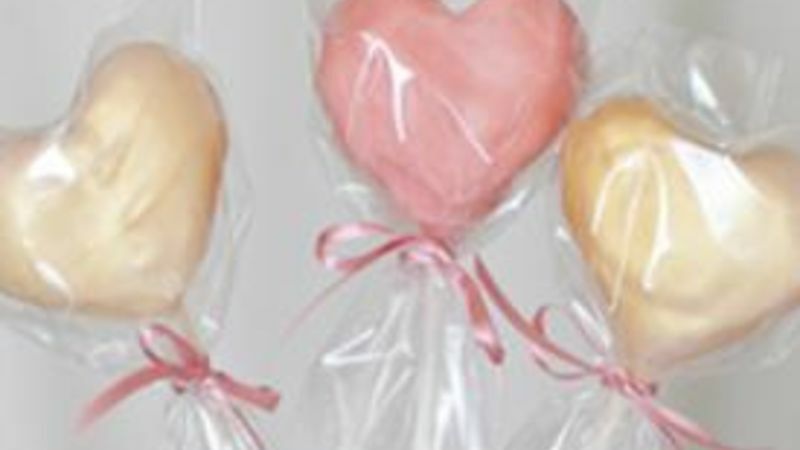 I made special heart-shaped Valentine's Gushing Heart Pops with white and pink candy coating. A touch of metallic food mist to gives them an extra glow. I also added a special treat inside—a strawberry Gusher! Bake you box of Betty Crocker strawberry cake mix just the way you would if you’re baking any cake. Let the cake cool and then crumble it into a separate bowl. You should have very small pieces and no clumps. Add ¾ of a can of Betty Crocker cream cheese frosting and blend until it’s totally incorporated. You don’t want it to be too gooey, just the right texture to form balls. Roll the dough into 1 inch round balls. You can add a strawberry Gusher in the center if you want an extra special treat. Line the balls on parchment or wax paper and place in the freezer for about 10 minutes. Using a 1 to 2 inch heart-shaped cookie cutter, place it over the cake ball and then press down. With the extra cake from the top use your fingers to mold it into the heart-shaped cookie cutter. Then remove the excess from the sides. You should have a nice heart-shaped cake pop when you remove the cookie cutter. Place the hearts on parchment paper and refrigerate for 1 hour or freeze for 15 minutes so they are firm enough to dip. Melt the candy coating in a heatproof bowl and remove just a few cake pops at a time from the refrigerator. Leave the other ones in there to stay firm. Dip the cake pop into the candy and use a spoon to coat every side. Gently tap the cake pop against the side of the bowl to remove the excess candy coating. Package them up individually, like lollipops, and make your friend's, co-worker's and "special someone's" heart gush! Like these? Build on your cake pop skills with Party Cake Pops and Chocolate Truffle Cake Pops!